The issue of teen dating violence has gotten considerable attention in recent weeks, due to the abuse Rihanna suffered allegedly at the hands of her boyfriend, Chris Brown. This is a topic I wrote about recently as well. Through some work I'm doing, I recently became acquainted with a truly stellar initiative, MADE--Moms and Dads for Education to Stop Teen Dating Abuse. 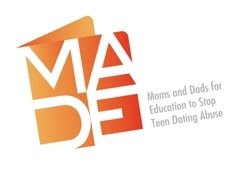 MADE is an offshoot of the groundbreaking Love Is Not Abuse program for teens, started by Liz Claiborne, Inc. in 1991. MADE is dedicated to bringing this issue into the light, ensuring that kids all over the country have "the education and resources available to maintain healthy relationships, free from abuse and violence." The folks at MADE are dedicated, organized and really pretty hip. They're even on Facebook.